Surprisingly I made it on time and without troubles to the underground station at Schiphol. When it works, it is a beautiful connection. 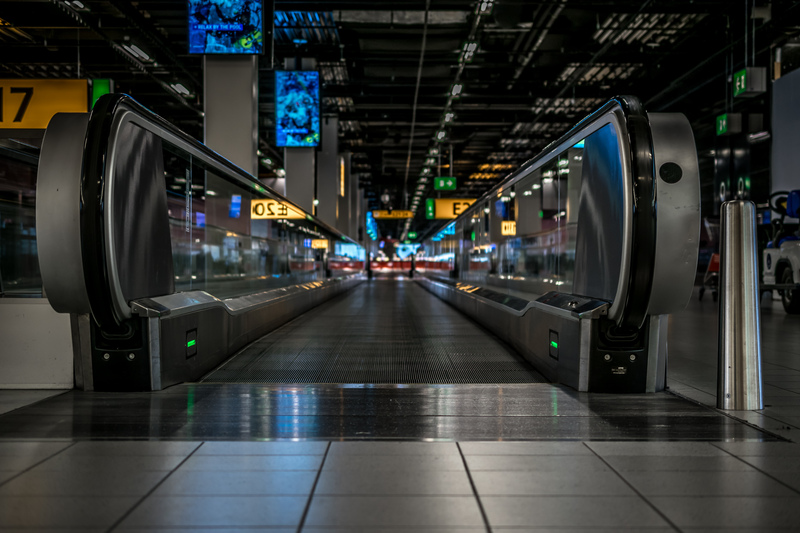 You step out of the train, take the escalator or elevator up, and you find yourself in the middle of the airport, all you have to do is choose between arrivals or departures. I, today, am among the happy people walking towards departures. Like last time, my suitcase was overweight, but since it was only 600 grams I didn’t have to pay extra, thank you KLM. There were some delays at the security checkpoint due to a huge group of Chinese tourists holding up the line. Leaving the rest of us with frustrated security workers. At least the passport control was a quick one since most people couldn’t use the automated gates. Those only work with European passports, and for a few other countries as well. They have them in Perth too, but not for Dutch passports unfortunately. We departed with a 20 minute delay because no less than three adults failed to make it to the gate in time, which meant the ground crew had to unload their baggage, for obvious safety reasons. How can you manage to check in and drop off your bags, then not make it to your gate in time? Are these people trapped in a toilet? Wasted in a bar? Oblivious to the world around them? While I was waiting at gate E20 I noticed a convoy with blue flashing lights driving past, followed by two trucks with panda decals and then a huge KLM Boeing 747-400 with both a Dutch, and a Chinese flag sticking out of the window. I realised that I was witnessing the arrival of the first two pandas ever to be sent to the Netherlands. Pretty nice to see, since I was waiting anyway. And I got some nice shots of the airport firefighters and police units. The pandas were being transported in cages, so I didn’t actually get to see them. At the moment we’re flying at almost the speed of sound towards Singapore. And I feel like a panda in a cage. The only seat left in the economy comfort zone was not an aisle seat unfortunately. And to compound this unfortunate event, the thing to my left is basically a hairy backed Italian trucker you wouldn’t hug to safe your life, with the strong hint of being female. She keeps invading my space, which I imagine is hard for her not to do since she clearly doesn’t have enough space around her own seat. She is obviously annoyed whenever I wake her up to stretch my legs (at 191 cm I really kind of have to) or visit the loo, but that’s the price she pays for having an aisle seat. I always feel uncomfortable having to ask someone to let me through, yet don’t mind people asking me, hence my love for aisle seats. I’m looking forward to my less roomy yet 100% more “aisle-ly” seat on Singapore Airlines in about 10 hours time. I wish we could unload her, but since we’re up in the air that might be a risky manoeuvre for the rest of us. The cabin lights have been dimmed by the crew, but as usual I haven’t managed more than two hours of sleep so far. My eyes feel tired but with this twisting and turning beast next to me I doubt I’ll sleep much more this flight. I’ll be jet lagged regardless, so what does it matter I guess? I just thought about letting a fart rip to get back at her. And I don’t mean a subtle one but the kind of fart that would make the oxygen masks drop down. Lucky for her I don’t resent the rest of the people around me. There are always people who just fall asleep and then leave their monitor on, playing the boring flight info display, illuminating half the cabin. I wish they would put those people on a blacklist, forcing them to only be able to book seats in the very back of the plane in the future. For those who read my post I wrote whilst flying the other way in February, I discovered why they still install ashtrays on airplanes. They fear people will still be stupid enough to try to secretly smoke onboard, and they want them to have a safe place to extinguish their cigarettes, instead of throwing them in the paper waste baskets or flushing them, potentially setting fire to the airplane. So, good thinking on the part of whoever thought of that. I love it when people come up with solutions to problems you never realised existed before you saw the solution to it. Just chalked up another two and a half hours of sleep. Or at least as close to sleep as I’ll get I reckon. I’m noticing light shining through the cracks around the little blinds in the windows, must be completely light outside. I wouldn’t really mind if they opened them up and put the cabin lights back on. That’ll wake up that gorilla next to me and stop her from sleeping on my shoulder! That’s about the worst that has happened to me yet during flights. Although the person sitting behind me on Etihad last April, who stuck his or her feet next to my chair/window is a good runner-up. By the way, she hasn’t gotten up once during the flight so far, so what does she need an aisle seat for anyway?! And she’s not eating any of KLM’s tasty meals, but she is devouring a big bag of M&M’s. I never imagined I would one day feel sad for a bag of candy. The steward just gave me something and a bottle of water, yay! Snack time! After miraculously falling asleep again, and having watched a movie, we are now finally starting our descent into Singapore. A little ahead of schedule even. Coming from Holland, I think it’s safe to say I understand what high density living means, most of the Dutch people are very well adapted living close together. But the hairy chinned woman next to me has taken it to a whole new level. She’s been so intrusive I’m considering having to redo my HIV checks and all vaccinations I have had since birth. I’m glad this wasn’t my first experience with flying to Australia, because it would set a horrible precedent if it was. At least KLM was on top of her game again. Just like last time I had to take the automated skytrain from terminal one to terminal three to make it to my connecting gate at Changi airport in Singapore. The annoying thing at Changi is they keep the gates closed for so long, so you have to wait somewhere else before you can go through the security check at the gate, instead of just zombie walking to your gate and vegging out until the plane gets there. Oh well, things could be worse I guess. Just bought a bottle of water at a random shop. The clerk was definitely a dude, yet he had breasts bigger than the average woman. I would like to say I wonder what he does on the weekend, but I think that’s pretty obvious. Almost ready to start boarding the Singapore Airlines flight that will take me home. Here’s hoping for a quick and uneventful flight. I’m surprised by the way how different security checks can be. At Schiphol I always have to take all my camera gear out of my bag, and I had to that at Singapore too, the last time I was here. But this time they said it was fine to leave it all in the back, except for the MacBook. And at Schiphol they took my bag aside because the saw a single screw that I forgot I had in my wallet. Only to let it through anyway, but at Singapore they either didn’t see it or didn’t care straight away. And once again, a speedy entry onto the airplane, only to be delayed again by a checked in passenger who didn’t make it to the flight. So his bag had to be offloaded too. This flight is going so much faster, only two more hours left, of which one hour will be spent on the remainder of the movie I’m watching. Dinner was a disappointment though, I’m in the first stretch of economy seats, yet by the time they (finally) reached my seat, they had already run out of chicken. All that was left was spicy fish and I’m not big on spicy. On the plus side we got an ice cream for dessert. The dude next to me asked for some water and the stewardess promptly spilt that water over the lady sitting in front of me. That happened to me once as well, I think it was on the return leg with Etihad in April last year. I’m glad the man next to me has the same ideas about not invading each other’s space, I wish everybody would be this considerate during air travel. I must say I haven’t experienced many of the “clichés” like crying babies, drunk passengers, heavy turbulence, or always arriving late. I’ve had my fair share of delays, but they almost always made up for that in the air. I think it has to do with the review-effect. Anytime you look for an online review, you’re bound to find some negative ones. Which makes sense, people who are happy or content with a service or product don’t feel the need to complain. People with complaints do, therefore they are more inclined to write a (bad) review. At least that’s what I think. And I don’t see why that shouldn’t work for aviation as well. If someone had an uneventful flight, nobody really cares. But if something out of the ordinary happened the story will have a significant longer lifespan. 52 minutes left until touchdown. We haven’t even reached Geraldton yet, but flying at 994km/h brings a lot of things close. I’m really curious what will happen at customs. The options you get on your incoming passenger card are split up in three groups. Firstly, tourists, in which case they want to know when you’re going home again. Second, an Australian citizen returning, or in my case today, the third option for “Migrating permanently to Australia”. Just one box to tick, no further questions. I figure there are no other questions to fill out, either because they don’t have any, or because they have a shitload of them, and they’re going to sit me down in a little office to ask them. I’ll find out soon enough I’m sure. Great, just like that the flight tracking system now says it’s not going to take 37 minutes, but one hour and twenty minutes. Which, I hate to admit, makes more sense seeing that we’re still at 37000 feet. And the cabin crew still have to serve breakfast, if they’re going to stick to the menu that is. I don’t really care for breakfast at midnight, it would just mess with my bio rhythm I think. And now it has switched back to half an hour… well let’s hope they’ll skip breakfast and start our descent soon. I’m done with flying and I have a beautiful woman waiting for me at the airport. YES! The captain just told the cabin crew to prepare for arrival and we have started descending! The landing was a bit shaky, I think the pilots had some trouble with the crosswinds coming in, but they got us down safely. I’m always pleasantly surprised by how compact Perth International Airport is. I had to wait a couple of minutes at the customs desk, there were some special cases in front of me who had to show all kinds of printed papers. I was very curious to see what would happen with me, since the incoming passenger card was so mysterious. Well, nothing happened. They checked my photo as usual, looked at my passport then at the screen. They actually did less than normal. I didn’t even got a stamp this time. By the time I got down the stairs to the baggage belts, they had already begun spitting out the suitcases that were on my flight, and I didn’t have to wait long for mine to appear. With nothing to declare I didn’t have to go through quarantine, and soon found myself walking towards the exit. Exactly 364 days after first walking through those doors, I was finally back to the place (and person) I now know I belong. There is nothing more fulfilling than to discover those two things in life. Outside in the cool midnight air of home, I let out a small sigh of relief. Relief because I made it back, symbolizing the end of my greatest adventure to date, yet small because the real big adventure is just beginning.